Bring a picnic, blanket and your camera. Take a stroll through the cherry trees and then sit and enjoy the view. Listen to the Japanese Garden's Mobile Audio Tour presented by Wegmans and powered by Tourwand.com. Get in the mood for the festival with a presentation about the 1901 Japanese Pavilion of the Pan-American Exposition. This informative presentation will be followed by a Kimono demonstration, display and a fashion show! For 1 night only, a Japanese Hinadan will be on display. A Hinadan is a special doll display that represents the Heien era’s Imperial family. It is traditionally set-up in Japanese homes to celebrate Girls Day on March 3rd. This event is Free. Please arrive early to meet and mingle with the other guests. Harumo Sato, Chris Main, Vinny Alejandro, Thomas Webb, Chris Piontkowski, Ashley Kay and Mark Adamusik. Devious, A Trex, Yedo and Miosi. Taiko Drums in the garden: Try out the Taiko Drums and see what it’s like to be a Taiko Drummer! 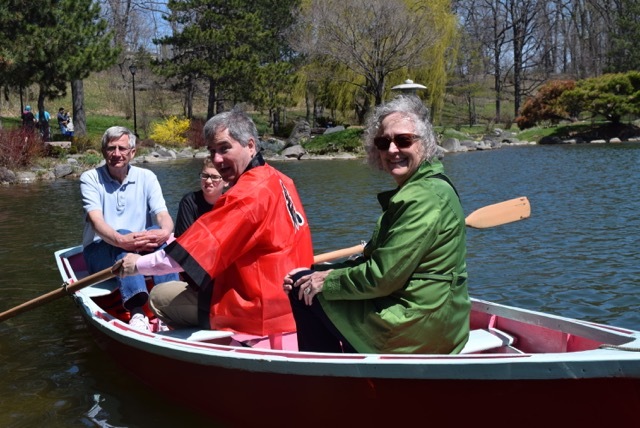 Pink boat rides on Mirror Lake: Take a ride around Mirror Lake and see the garden from a different angle. Navigate your way on a 2.8 km course that starts and ends at the Japanese Garden traversing Delaware Park including the History Museum, Hoyt Lake, Marcy Casino, Rose Garden, Rumsey Woods, Mirror Lake and the Japanese Garden. Register and start at 11:00 am near the Buffalo History Museum on Nottingham Terrace near Elmwood Avenue. Designed for any experience level, walkers or runners. Instruction available. Register in advance to guarantee a map. A limited number of additional maps will be available on a first-come, first-served basis. $10 registration fee ($5 members) includes instruction, meet and 5-color map. Questions about the event? Email the Meet Director: David Cady, or call him at (716) 837-3737. Assistant meet director: Adam Cady. ​Celebrate the festival inside the museum and outside in the Garden with cultural displays and music. 12:00 pm Josh Marcks (Puppeteer) Presentation of san ninzukai and kuruma ningyo puppetry styles. 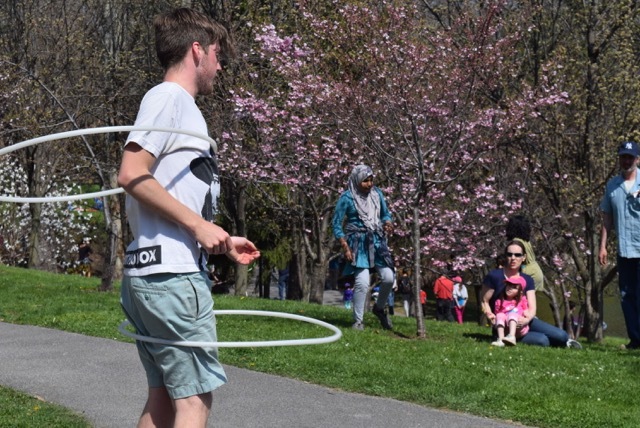 2:45 pm Pink Parade to officially close the 2019 Cherry Blossom Festival. All welcome, bring your brightest pink to show your spirit and blend into the garden while standing out in the crowd. Puppet shows, origami, bonsai, Japanese folk dolls, Papercraft, Kanazawa exhibition and display. Join us for an authentic Japanese Tea Ceremony. The date will be during full-bloom and will be announced with a 48 hour notice. Check our Website, Twitter, FB and Instagram for this 'pop-up' event date. Free parking is available in the Museum parking lot. If that is full on the days of the festival, street parking is available. Please read the City signs to confirm that your parking is legal. The police will ticket illegally parked vehicles. Additionally, we enjoy a good relationship with our neighbors, so we ask that you park with consideration of the home owners in the neighborhood. Please do not block any driveway. Music is a highlight of the festival. Pink Boat Rides on Mirror Lake! 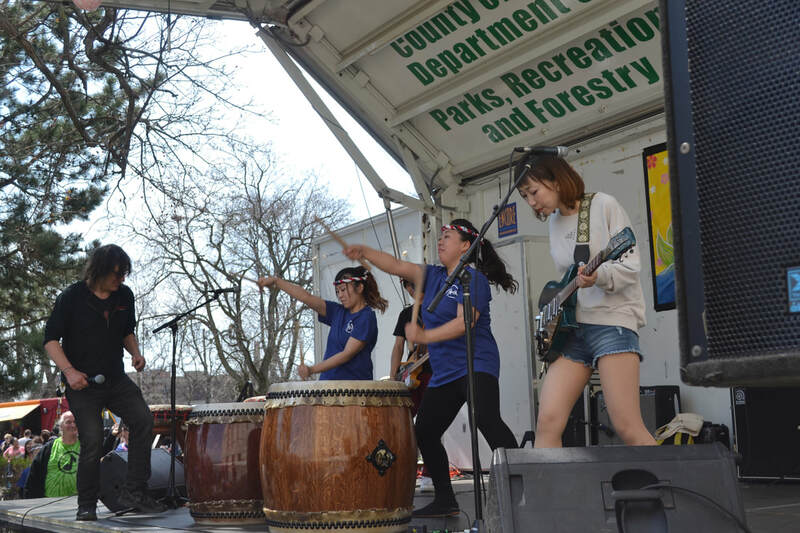 Taiko Drums, Picnics and Parades, Oh my!